Are you tired of hookups and fake relationships? Looking for a guy or girl with whom you can share everything and make a connection with them? Then, no more guys, I will help you find your perfect soul-mate. Everyone needs a partner who is trustworthy, with whom you will spend your whole life. It’s not easy, however, not difficult too. Connexion is a dating app recommended for people who are searching for their partner. Connexion has been developed by Alain-Serge Nagni. The current preferred devices that can support this app include iPad, iPhone and iPod touch. Additionally, it requires iOS 9.0 or any new version of the Operating System. 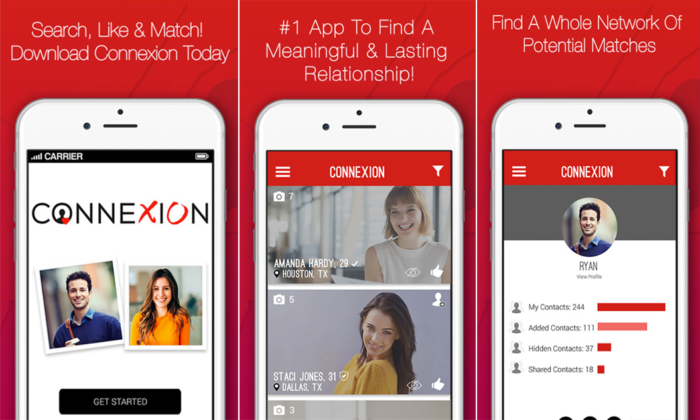 Unlike most dating apps, Connexion focuses on long lasting and meaningful relationships. It’s matches lead to quality dates with longevity; not hookups with its custom developed personal formula. You need to register on the app and invite your friends and other people also. By boosting the reach and reliability of your contacts and peripheral acquaintances, it creates a network of matches that are more likely to trust and you want to date. You can expand your search by requesting access to your friend’s contacts. The Smart Profiles will show your common contacts, allowing you to quickly see the links between you and your potential matches that are connected at a glance. But what’s the unique part of this app? Who are it’s Matchmakers? They are your connections. They are your Friends, Family Members and Co-workers. They are willing to help you meet your partner by introducing you to other singles. They only need to share their contacts with you and the search filter will do everything. You can anonymously invite other people to join Connexion and instantly delete or hide unwanted users in your account. You will see only those people who you want to see and allow them to see you also. Get winks and texts only from the people you like. This app is really safe and secure which deals with only real people. Validity is one of its top concerns. That means no fake profiles like other dating apps. It is one of the fastest growing dating apps in the whole world. The display of the app has been just fantastic and highly defined. However, the prices are in U.S dollars and may vary in other nations. You can consult the website for other info. Try it today and find your perfect partner with Connection. Deals with only real people. Helps to find a true life partner.